GreenSpring's Harping in the Hospital Outreach Program partners with local healthcare facilities and hospitals to serve hundreds of patients, residents, and families in the Richmond region. In addition to the obvious qualitative benefits, the program is designed to measure the quantitative impact of live harp music on health and well-being. Past studies have included the measurement of pain reduction, post-op recovery time, sleep, heart rate, blood pressure, breathing rate, and the reduction of the effects of Sundowner's Syndrome in Alzheimer patients. GreenSpring is on the forefront of the national Harp Therapy scene, as director Lynnelle Ediger-Kordzaia was an early adopter of the movement in 1999. Since then, GreenSpring has hosted the International Harp Therapy Conference twice. Use of the harp as a therapeutic instrument is not a new concept: the harp has traditionally been used as an instrument of healing across cultures throughout the millennium. The earliest example of the harp being used as a therapeutic instrument is depicted in cave drawings in France dating to 30,000 B.C. As patients and health care providers turn to holistic approaches for health and well-being, the harp is a natural fit due to the timber (sound) and vibration. Harps may now be found in numerous healthcare settings including Oncology units, Neonatal ICU, Adult ICU, Hospice and even in the Operating Room! 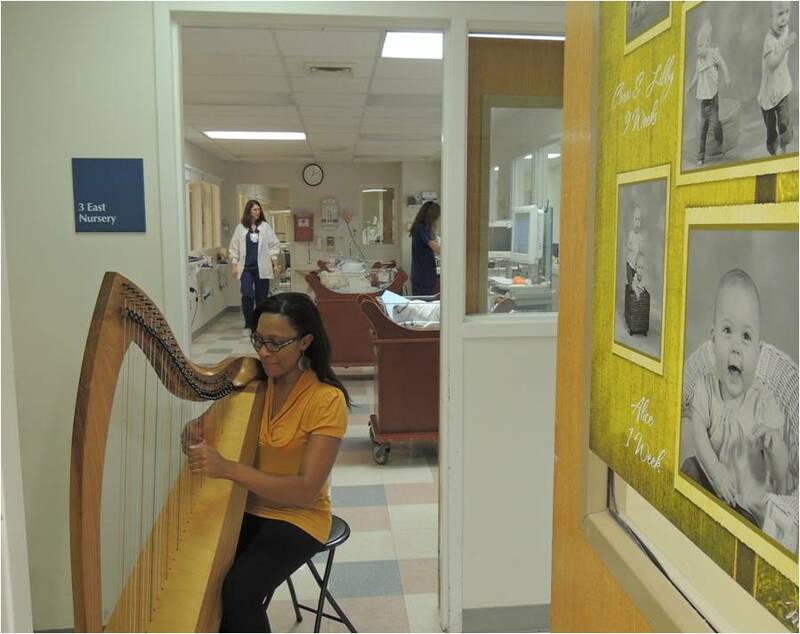 Patients, family and staff alike benefit from the stress-relieving power of the harp.